The stock market in 2019 has been bolstered by mostly positive earnings results, signs of strength in the labor market and the Federal Reserve Open Market Committee’s reaffirming their commitment to be “patient” about further rate hikes in light of recent global economic and financial developments and muted inflation pressures. While January was a blockbuster month for the stock market, the first week in February saw U.S. equity markets finish basically unchanged from the previous week and may reflect concerns over slowing global economies, trade concerns and an earnings slowdown. As the U.S. economic expansion continues into its tenth year, we are seeing a mixed picture of the U. S. economy. The job market is healthy and business investment is strong. Yet we have seen manufacturing and services Institute for Supply Management surveys decline. Confidence among CEOs and small businesses that greatly influence spending and hiring, has dropped to the lowest levels in more than a year. Consumer confidence has also declined, which implies slower consumer spending ahead. There has been a slowdown in interest rate sensitive sectors like housing and autos. Although our outlook for 2019 includes positive year over year returns, there remains sufficient intermediate uncertainty to recommend focusing on the strongest areas of the market. 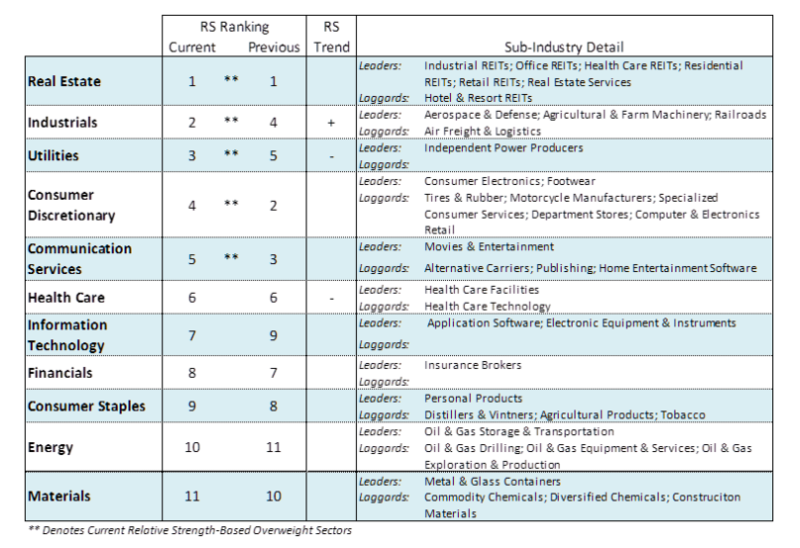 The top five sectors in our work include REITs, utilities, communication services, industrials and consumer discretionary. The technical overbought/oversold indicators have rotated in dramatic fashion from deeply oversold in early January with investor psychology very pessimistic. The January rally has encouraged increased optimism allowing investor sentiment to come full circle from late-December readings. This is seen in the Ned Davis Daily Trading Sentiment Composite that is now in the excessive optimism zone from deep pessimism in late last year. Additionally, the National Association of Active Investment Managers (NAAIM) Exposure Index is all the way back to where it was as stocks were peaking in September, indicating a return to excessive optimism. The CBOE Volatility Index (VIX) has fallen to early October levels suggesting that the mood of investors has shifted from being fearful to optimistic. 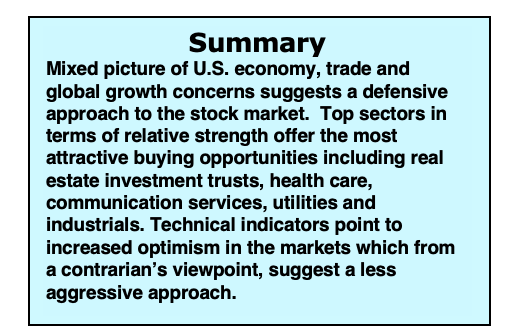 We view investor sentiment from a contrarian’s lens and by definition the return of optimism argues for a less aggressive approach over the near term.